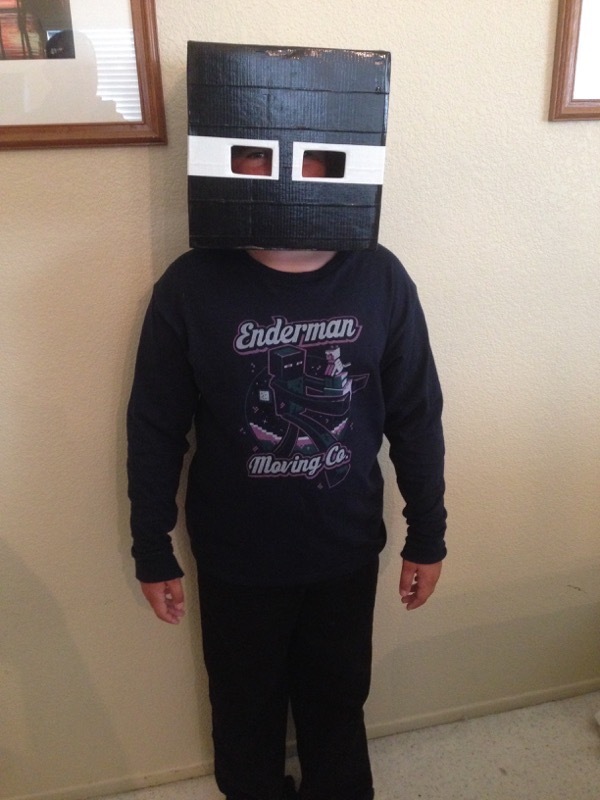 All of our boys this year have been particularly into Minecraft, and when our son Ian said he wanted to be an Enderman for Halloween, we scratched our heads wondering just how to pull it off. 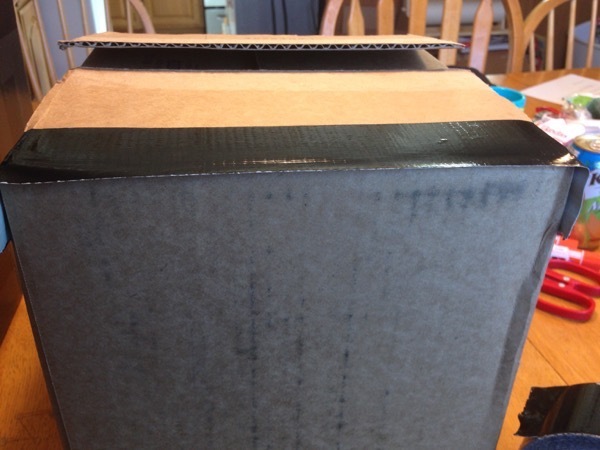 Creating a Minecraft Enderman Halloween Costume seemed easy enough, and this how-to from our experience should help you out. 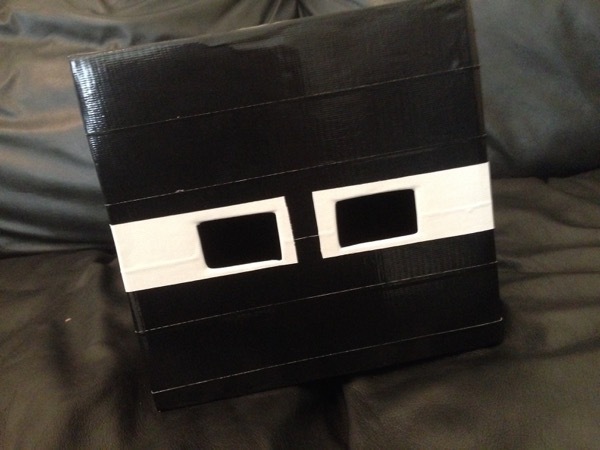 On his birthday, Ian had received one of the cardboard Enderman heads. Though pretty cool, the biggest problem with the cardboard head was it was giant, didn’t fit his head well, and seemed flimsy. Not only that, but these things cost $25 a piece. I thought, “I can make one of these things myself,” and so it began. 3. 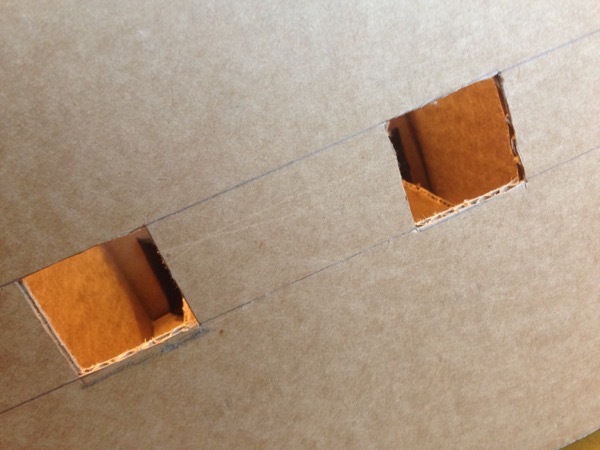 Cut excess cardboard all the way around till the box rests on head without hitting shoulders (save this excess as it will be used inside to make a headband). 4. 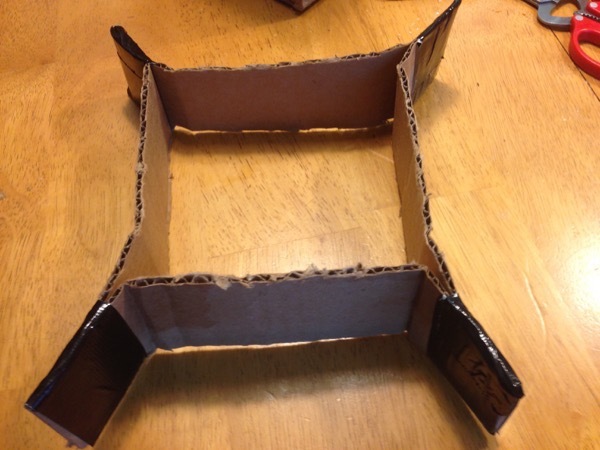 Create headband by taping each corner like shown in the picture above. 5. Test fit the headband on your child’s head, it should be snug. 7. Once glue dries test fit onto child’s head and press down on the top of their head for a snug fit. 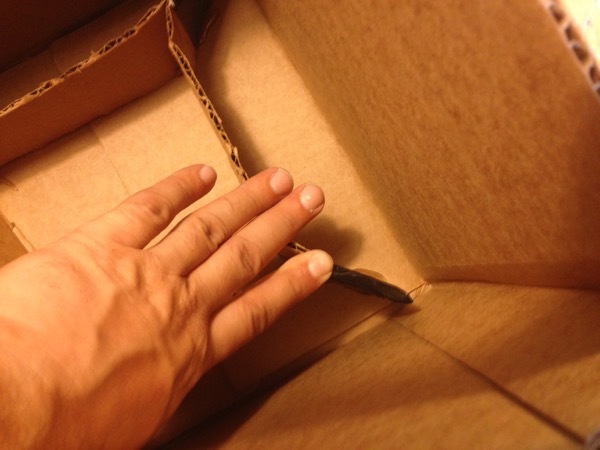 Make sure head moves box without touching shoulders. 8. 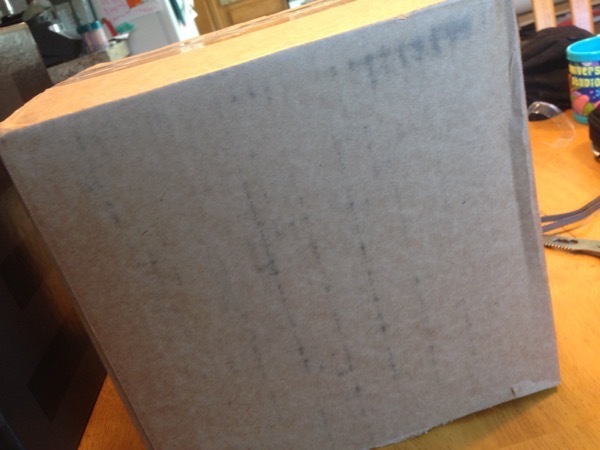 With box on child’s head, use a ruler to best measure to the center of their eyes, take box off child’s head and draw a line on the box above and below the mark so that the cuts will be centered on the eyes. 9. 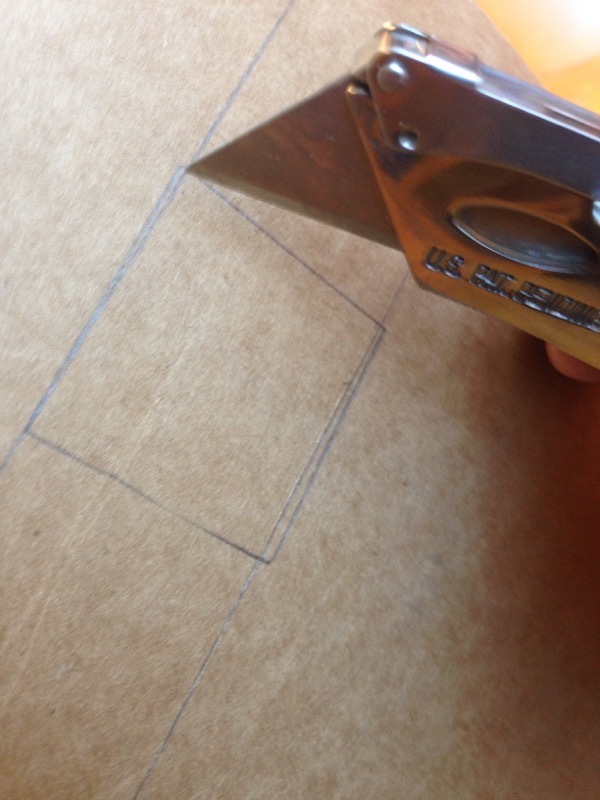 Cut rectangular eye holes out and test on child’s head for visibility. 10. After initial cut I found the eye’s were too far apart so I had to cut them further toward the center in order to give Ian good visibility. 11. 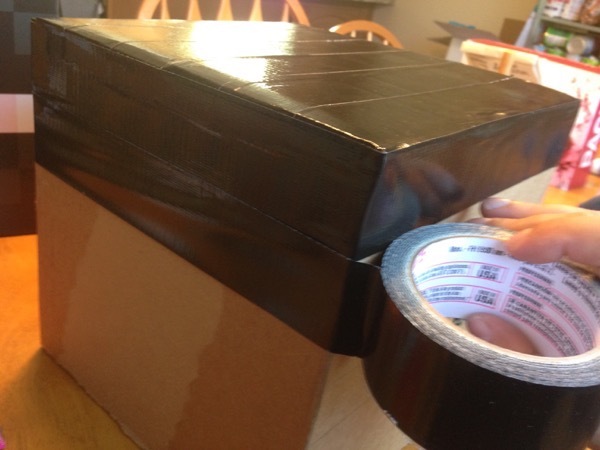 Now its time to begin wrapping the box in Black Duct Tape. 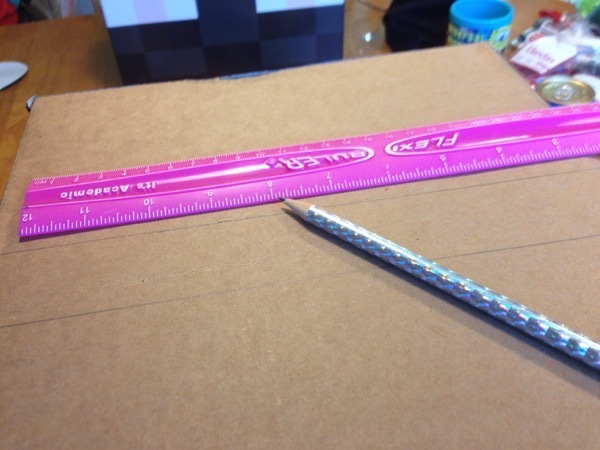 I started at the top and used strips that overlapped the edge by about 1″. 12. 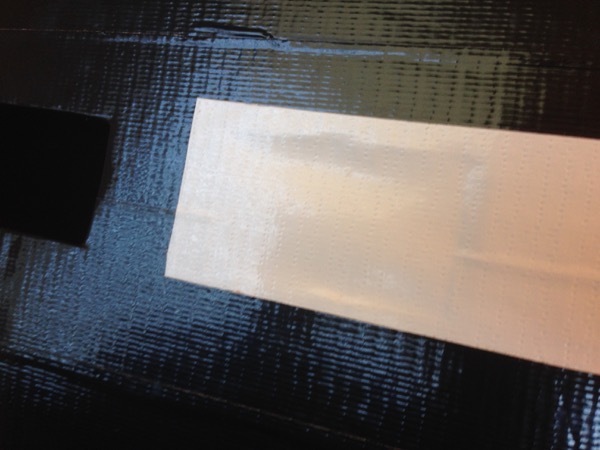 Once the top is complete, begin wrapping sides using roll of duct tape, cut each row and start next row to keep lines even. 13. 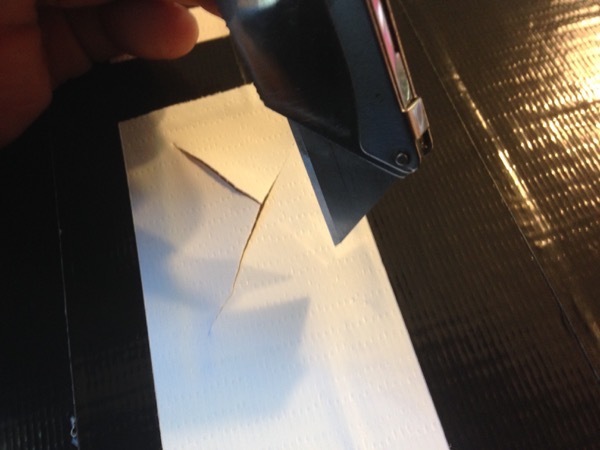 Complete entire wrap, then cut out eye holes with x-acto knife or box cutter using an X from corner to corner of eyeholes allowing you to push tape into eye holes for a cleaner look. 14. 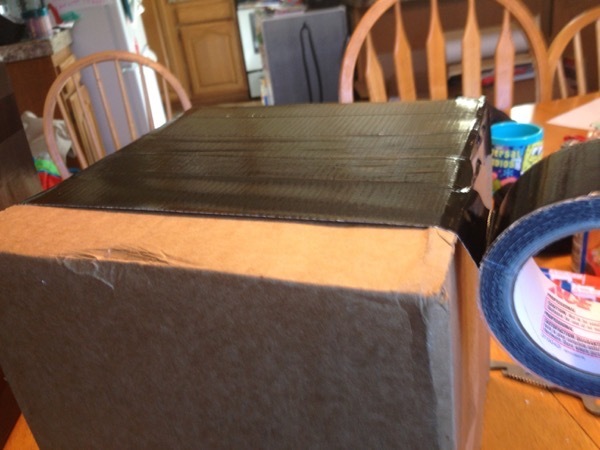 Center white strip of duct tape on eye hole and place to edge of mask on each side. 15. Once again cut eye holes in X pattern and push tape into eye holes. 16. Your mask is complete check final fit and finish on child’s head and make any necessary adjustments. 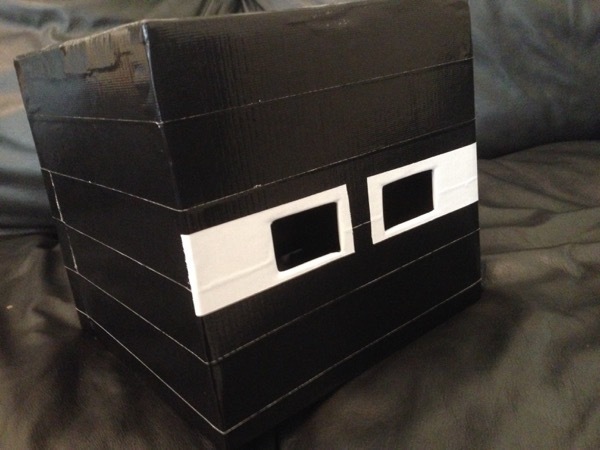 Round out your Minecraft Enderman costume with a black long sleeve shirt, black pants, black shoes, and black gloves, and enjoy your DIY Minecraft costume! That is so cool and looks easy to do, he looks just like enderman. This is sure a unique easy costume. He looks good! You did a great job on this! i just love this.so cute !!!!!! This mask looks very cool. Thanks for the how-to!